Sedona, the Movie: Vortexes, Auras! Oh, My! Sedona, Arizona, is stunningly beautiful—”The most beautiful city in America,” USA Travel called it—but also beset by an often distracting New Age loopiness. “You know what?” a local psychic tells the frazzled main character in the movie Sedona, “You need an aura cleanse,” to which she screams, “Oh, for God’s sake! I’m in a real crisis here!” Sedona’s got crystals. Sedona’s got more vortexes—spots where earth and cosmic energies supposedly align—than Machu Pichu and the Great Pyramids combined. But beyond all these, what perhaps captures the city’s power most succinctly is the sentence, “There are no coincidences in Sedona.” I know. I live there a few weeks every year, and if I don’t hear the sentence at least once a day, its sentiment pervades the place like air. What’s got the main character, Tammy, so frazzled is that she—a high-powered, work-obssessed business woman—is rushing down to a meeting in Phoenix when a freak accident strands her in Sedona. The movie opens with gorgeous views of Sedona’s iconic red rocks, canyons, and valleys shot from one of the many tourist planes that—with helicopters and balloons—constantly criss-cross Sedona skies. The plane has engine problems and can’t get back to Airport Mesa, landing instead on the city’s main north-south drag, Highway 89A, and crashing into Tammy’s car. We follow her typically exasperating adventures trying to get the car fixed, adventures which bring her into contact with sometimes zany locals—one who not only massages but reads feet—all steering her away from her work and car-obsessed life into some deep, healing soul searching. It’s a labyrinthine quest featuring her walking through an actual Sedona labyrinth as she begins to mend the broken pieces of her present life by dealing with the brokenness and abandonment of her past life. Veteran actress Frances Fisher plays her beautifully. There’s a second story line. A gay couple, Scott and Eddie, have taken their sons, Denny and Jeremy, on a Sedona vacation. Scott is also frazzled, work-obssessed. It’s hard to get him off his Blackberry, until Eddie shames him into leaving it their van, something Scott wishes he hadn’t done when youngest son Denny gets lost. One viewer commented astutely that the movie leaves out all Hispanics, a large presence in Sedona, but, though perhaps a bit forced, it does nod towards Sedona’s Native American heritage, bringing in actor Tatanka Means as the Native American park worker who helps track Denny down. Of course, he’s calm and wise, a blaring contrast to Scott. These two story lines meet briefly near the movie’s beginning but go their separate ways immediately, so much so that we’re sometimes annoyed by their utter dislocation, the movie becoming rather jagged as it continually cuts back and forth between them. Eventually, the two stories do meet. In fact, they literally crash into each other when Tammy’s finally-fixed car plows into Scott’s van. As they exchange information, the movie begins to suggest an eerie, deep relationship between Tammy and Scott, a relationship that makes Tammy forget about ever getting to Phoenix. The suggestion is heavy, but wisely stays at that level. That’s the trouble with the there-are-no-coincidences stance. When things work out too perfectly, when seemingly random events turn out to be eye-poppingly non-random after all, a movie, a book, any story-telling vehicle, has to handle this very carefully or discerning viewers will just throw up their hands and scream, “Awwww!! !” They’ll feel cheated—though, of course, most people won’t, which is why sappiness or spectacular conspiracy plots rule the box office. 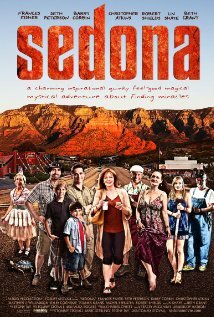 Sedona balances on the line between reality and wish fulfillment, truth and sappy optimism, and, overall, I think it keeps its balance relatively well. I’ve grown less dismissive of Sedona’s loopiness over the years, knowing how sincerely so many believe in auras, crystals, past lives. Walking its stunning landscapes, I often catch myself thinking, I see why people feel spirits roaming here and vortexes doing whatever they do. But it’s really Sedona’s intense beauty that gives rise to the idea that there are no coincidences. One key component of anything we call beautiful must be a sense that somehow everything fits together perfectly, so much so that even coincidences don’t seem accidental. It’s tough to plot the beautiful without getting saccharine, and capturing beauty on any kind of camera will always be a dicey, difficult job. And maybe Sedona is too much a special case. Many moments in our lives just aren’t all that beautiful, just as most places aren’t Sedona—unless you’re one of those that insists that everything is beautiful in its own way. I suppose at some high-up level that could be true, but people walking around up there are often humming some pretty pollyanna songs and wearing some strong, rose-colored glasses. Go Here for a list of reviews. The Emmanuel House main page, which features a chance to win a vacation in Sedona. This entry was posted in Reviews & Commentary and tagged beauty, Frances Fisher, Reviews by Richard R. Guzman, Sedona-Arizona, Sedona-The Movie, Tatanka Means. Bookmark the permalink.